Oliver Ames, 58 vs. Barnstable, 44 – Final – Click here for a recap of this game. Sharon, 57 @ Norwood, 40 – Final – Sharon built an 11-point lead by halftime and never looked back to earn its first win of the season. 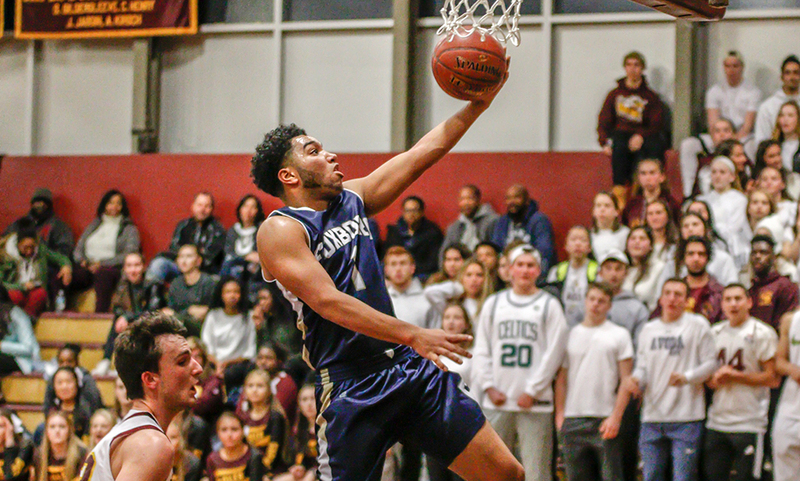 Senior Malik Lorquet had a big night with 16 points and 16 rebounds while senior Jimmy Fitzhenry scored a team-high 17 points to go along with seven boards. NORTH EASTON, Mass. 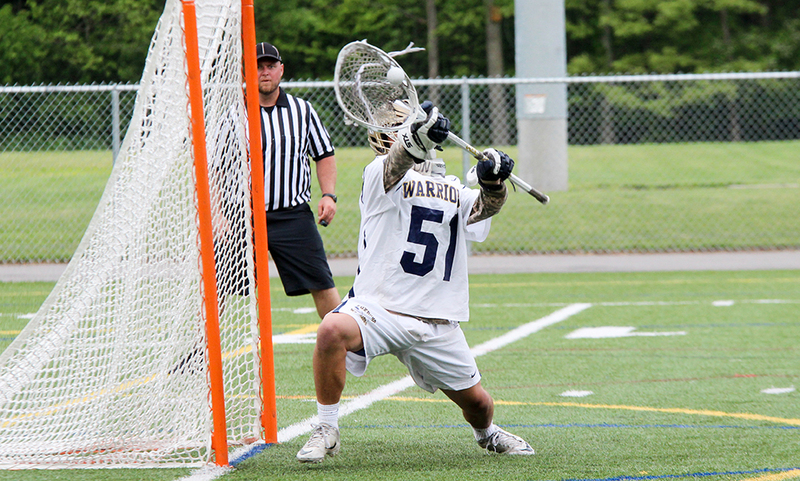 – For the second straight game, an improved defensive performance in the second half led Oliver Ames to a win. The Tigers ramped up the aggressiveness of their 2-3 zone in the second half, holding Sharon to just five points in the third quarter to turn a deficit into a lead, and eventually a 57-49 win over the Eagles in an early-season rivalry game in front of a packed crowd. “I thought we did an exceptional job in the second half with the defense,” said Oliver Ames head coach Don Byron. “On the defensive side, it wasn’t too bad early but when you don’t make shots you spend an awful lot of time on the defensive end. We kept Malik [Lorquet] somewhat quiet in the second half and we got out of almost all of the shooters besides a couple of breakdowns. Trailing by six at the halftime break, Oliver Ames opened the second half with a 12-0 run over the first 4:20 of the quarter. OA’s zone paid off right away as the Tigers forced a shot clock violation on Sharon’s first possession of the half. Jack Spillane (game-high 22 points, 10 rebounds, five assists) started the run by draining a three-pointer and Ethan Eckstrom (eight points, nine rebounds) converted a putback and scored down low on two of the next three possessions. Sharon got a stop but was called for a technical, allowing Spillane to hit two free throws. Just over the midway point of the quarter, Spillane went over the top of a switch with Sean O’Brien and drained another three from straight away to cap the run, giving the Tigers a 34-28 lead. During that stretch, the Eagles had a pair of turnovers, went 0-for-2 from two-point range, and 0-for-4 from three-point range, all but one attempt coming in the final seconds of the shot clock. “They were very aggressive in the way they were attacking the wings,” said Sharon head coach Andrew Ferguson. “We had a couple of guys out of position and we just got a little soft with the way we were taking it to the basket, we had to be stronger. Malik got into a little foul trouble and we kind of lost our way offensively. We’re better when we’re attacking the basket and I think we kind of lost that in the third quarter. 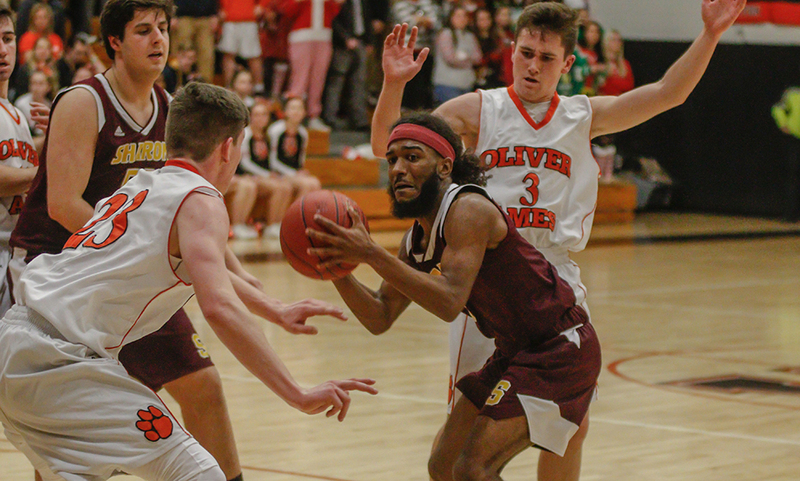 The Eagles finally got on the board with just under three to go on a floater from Jayvon Monteiro, but five straight points from OA senior Matt Muir (11 points) – two on a strong baseline drive and a corner three on a drive and kick from Spillane gave OA its largest lead – 39-32 – late in the third. “I think when we got the ball inside, we needed to finish a little bit better,” Ferguson said of his Eagles, who shot 32% from the field with just eight free throw attempts (compared to 26 from OA). “We needed to do a bit better from the free throw line…I would have liked to get to the free throw line a little bit more, maybe as much as they did. 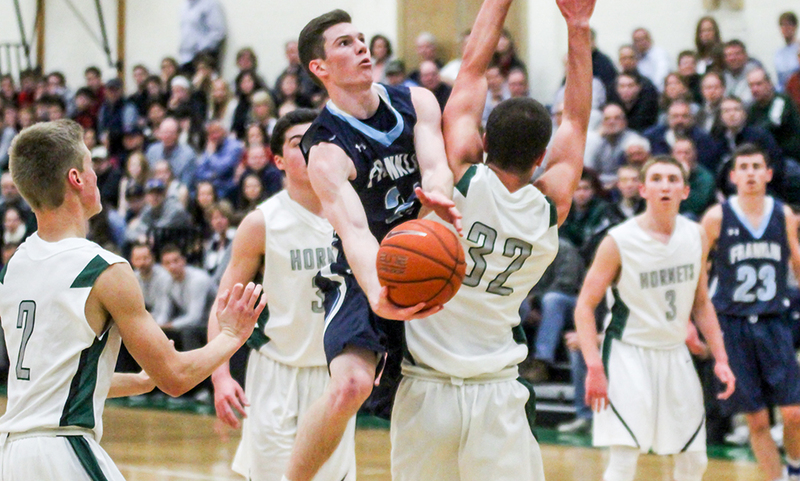 After going 0-for-7 from three-point range in the third quarter, Sharon got back on track when Jimmy Fitzhenry (nine points, eight rebounds) and Aidan Kane hit back-to-back triples to tie the game a minute into the final frame. But the Eagles offense cooled once again. Two free throws from Spillane put OA up 41-39, only for Sharon to go 0-for-4 from three-point on its next two possessions, concluding three misses on one possession. Muir made Sharon pay with a corner trey to make it 44-39. A three from Alex Kaufmann brought the Eagles within two but that would be the closest they would get the rest of the way. Two free throws from Spillane plus a strong take from Eckstrom restored a two-possession lead. O’Brien (12 points) delivered the dagger with a three with two minutes to play, putting OA up 51-42. Kane hit a three with 17.6 seconds left to make it 53-49, but OA didn’t turn the ball over and took care of business at the free throw line to ice the game. Lorquet finished with 15 points and 14 rebounds to lead the Eagles. Sharon’s offense got off to a strong start against the zone, dropping 16 points — including three triples — in the opening quarter. The Eagles added 12 more points in the second quarter, owning the glass 11-6 in the frame. Meanwhile, Oliver Ames got off to a slow start, hitting just one field goal (5-of-6 from the free throw line) and six turnovers. The offense came alive a bit in the second quarter, going 3-for-6 from downtown to get within 28-22 at the break. Sharon (0-2, 0-2) will look for its first win of the season when it hosts Attleboro on the same day.